Jeen’s parents brought home some kit kat from Japan, and she was nice enough to share some with me (and rif)! I got 4 flavours – peanut, strawberry, peach and green tea. The chocolates were very creamy and some were a touch too sweet. Of the lot, I liked the peanut best. Thanks Jeen! I like the Green Tea one!! I just cannot get enough of the novelty flavours Japan has…. my last visit, I went crazy over the wide range of Pocky flavours! My favourite is the Goma (black sesame) one! I have to go back… Mondays are the pits! Have a break, Have a Kit-Kat!!! Wow!!! There are so many flavors of kit kat? I wanna try.. I wanna try…. hehehe. foodbin – Yup, apparently they have more than 81 flavours! email2me – Hahaha…if they make all their products THIS sweet, YA! 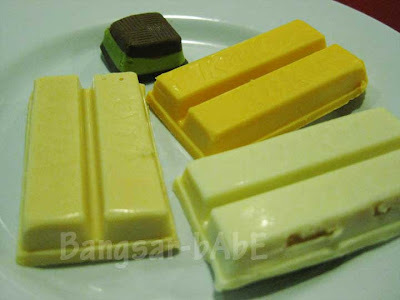 ahhh..just get to know that not only 1 flavour kit-kat..other flavour tim! totally agree with u! who doesnt hate monday. Cookie Dough Kit Kat Chunky?? Sounds like my kind of chocolate bar!! yaya ya..why otr countries alws hv more innovative food choices than us one ar?? 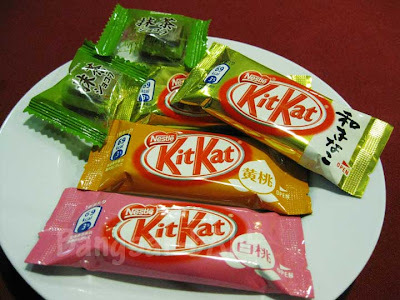 I love the green tea kit kat’s! thenomadGourmand – Well, we’re quite creative with our burgers, no? I tried a few flavor, it’s always amazing how Japan come up with so many unique flavor snacks.